This year for the Muslim holy month of Ramadan, HRC Foundation is launching an online campaign to tell the stories of LGBTQ Muslims and their allies. Ramadan is the holiest month in the Islamic calendar when God revealed the Qur’an to Prophet Muhammad. During this time, Muslims, including LGBTQ Muslims, fast from dawn until dusk and are encouraged to pray, read the Qur’an and give to charity. 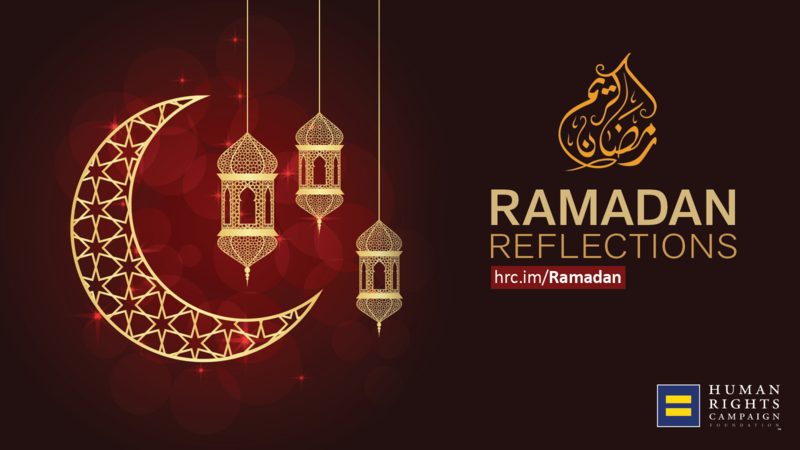 We hope the reflections offered every week starting May 27 until Ramadan culminates in Eid al-Fitr on June 25, will bless souls, revive spirits, renew minds and strengthen bodies. These stories will be hosted on the HRC website and on Twitter and Facebook. A few years ago, my friend Jamilah suggested we read the Qur’an together daily during Ramadan. I hesitated, wondering where we would find the time, but agreed. The first time we read Qur’an at a scenic overlook on Mount Tom, it seemed fitting, recalling the Prophet Muhammad’s (PBUH) spiritual retreat to a mountain cave during Ramadan, where he received the first revelations that would become the Qur’an. It took only a few days for me to be hooked on this daily Qur’an reading practice, building my schedule in Ramadan around it, instead of trying to fit it in. This practice was not familiar to me from what I had learned about celebrating Ramadan as a new convert, nor was it something I'd experienced in the nearly thirty years since. Over the years, much of my religious practice had become solitary. To find community, many of us—like the earliest Muslims—have been building it from the ground up. LGBTQ Muslims, from all over the world, who have been to Muslim Alliance for Sexual and Gender Diversity retreats find community together online. In Toronto, the El-Tawhid Juma Circle hosts an inclusive Friday prayer that people anywhere can connect to via Skype. Across the country, individuals are getting together and creating communities like Masjid Al-Rabia in Chicago, Queer Muslims of Boston, and Masjid Al-Inshirah/Pioneer Valley Progressive Muslims in Northampton, Massachusetts. Transgender Muslims are finding support with the Transgender Muslim Support Network and building community with the Transfaith Trans and Muslim project. When I created a Facebook group and posted the first flyers for Pioneer Valley Progressive Muslims, I had no idea who would show up and what they would bring to the community we would create. I could never have predicted that it would lead to a new tradition of reading the Qur’an on Mount Tom, taking in the late afternoon sunlight, with queer, straight, trans and cisgender progressive Muslims who have all come to this point by different paths. I know from experience it is possible to be a solitary Muslim whose faith is practiced primarily at home, but I also know that being in community brings unexpected rewards. Taking the risk of reaching out to find supportive, sustaining community, or creating space for a community where none exists, are a lot like making our way up a mountain. We don’t even have to reach the top for the view to be spectacular.